grandma's cookie jar: crafting with grandma - Tie Key Chain for Father's Day! crafting with grandma - Tie Key Chain for Father's Day! 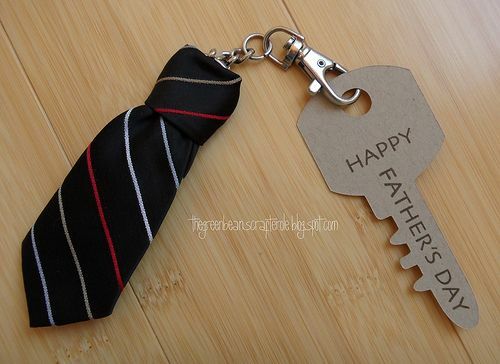 If you are looking for a cute and fun Father's Day gift project you could work on with yourgrandchildren for their dad, take a look at this one I found on Pinterest for a Tie Key Chain! Just follow this link and you'll find a supply list - you just need an old tie, scissors, glue and a key ring - and a photo tutorial for making your little ties! Simple, fun and an item a dad could actually use! It could also be a fun end-of-year gift for a school teacher, coach, Scout leader . . . etc! Have fun making these ties with your grandchildren!